There are few sadder sights than two old blokes trying to describe their team scoring a goal. Yet in Red Ladder’s production of The Damned United, we are subjected to this sight a few times. And this isn’t even the worst of its crimes. Phina Oruche has had an extraordinary career. Growing up in Liverpool to Nigerian parents and desperately wanting to see more of the world, she let her best friend Amy talk her into doing a modelling photoshoot as a teenager. Soon she found herself living and working in London, then New York and LA. Eventually tiring of the high fashion world and feeling the pull of her home, she moved back to the UK where he career led her firmly into the film and telly world. Now a mum and conflicted about the cultural pushing and pulling on her life, she examines who she really is the self-penned Identity Crisis. The punchy tapestry of characters and experiences has messy and confusing moments and no clear resolution or story, but it’s brimming with heart and life. The American dream is a tantalising thing. Even the grubbiest kid from New York, the son of a nobody dentist, can become a film star and producer. This is Robert Evans’ story, the man responsible for pictures like ‘The Godfather’. Complicité’s Simon McBurney adapted the show from Evans’ autobiography, which paints a picture from a better time: when movies were pictures and hard boiled men tacked “see?” on the ends of sentences wreathed in cigarette smoke. It is visually sumptuous and the cast of eight are a constantly churning ensemble that whip the story into a froth and delivery a sensory overload of American tropes and history and multi-media tricks. Given the subject matter, the desire to incorporate all of these elements makes sense. First loves: awkward, hormonal milestones of young adulthood that make you feel like you’re on top of the world in a bubble that’s just the two of you. That is, unless you’re a trans or gender fluid teen who is still exploring gender identity, or someone with extensive family problems. But issues like these, when married with a youthful story of falling in love, make for some powerful and moving theatre. Love, Lies and Taxidermy compares falling in love for the first time to living in a film. With narration incorporating stage directions, short scenes reminiscent of quick cuts and a wonderfully ridiculous conclusion, the play feels like a teen romcom, but has enough substance to ensure it isn’t total frivolity. It’s fluffy, sweet and addresses how social class can effect young love. Set in Myrthyr Tydfil where all road lead to Tesco, Ash and Valentine meet at hospital when they’re both waiting to see if they qualify for paid medical trials. Ash’s dad is on the verge of bankruptcy, and Val’s parents are separated so he wants to send them on a cruise in hope they will fall in love again. The tentatively begin dating, but life has a way of interfering with their time together. Ash has other ideas to earn some quick cash courtesy of an aspiring filmmaker college mate, but devoted Val vehemently opposes them. Cue a mad dash adventure to rescue Ash from her poor choices and live happily ever after. There are a few lose ends in the narrative that get forgotten in favour of the “boy rescues girl” plot line, like Val’s quest for money for his parents. They could easily be trimmed to get to the point faster, or developed further to make a more fully-formed story. The cast of three display remarkable energy as they play all the roles. Remy Beasley and Andy Rush are Ash and Val, the young couple who clearly fancy the pants off each other. Rush, though the hero, goes against the stereotypical popular lad who wins the girl through violence and strength. Awkward and geeky, his devotion to the bold and brassy Beasley is utterly adorable. Beasley’s confidence also goes against the romcom trope; she most definitely does not want to be rescued even though she doesn’t want to make the money in the way she has chosen. The ending, however unrealistic, charms and delights. Though there is no set to portray the described splendour, the text more than makes up for its absence. 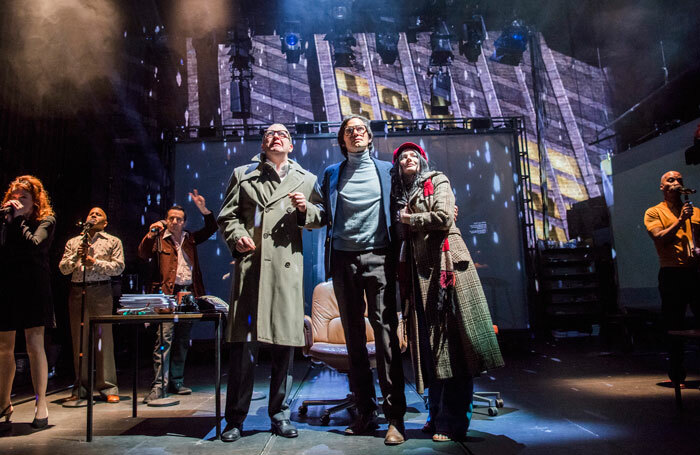 The intimacy of the Roundabout suits this play well, though a larger venue would give more scope for design. 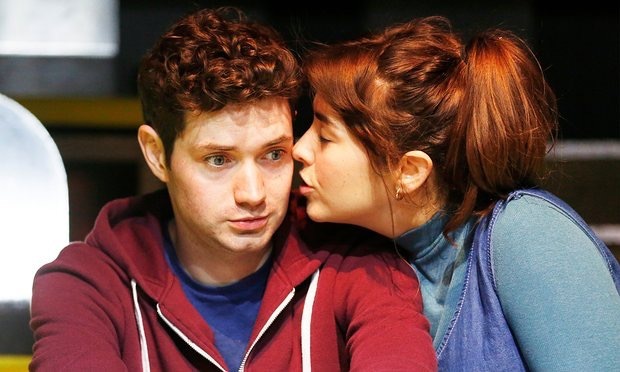 Scorch takes a different tone from Love, Lies and Taxidermy, though it also has a generous helping of youthful optimism about love. Kez, a bio-girl who dresses as a boy when not at school Orr home, has met Jules online and is smitten despite the “cool dude” exterior. This story has a darker outcome what with the complexities of gender identity and disclosure as it reinterprets the classic coming-of-age tale. Kez is perky, accepting and generally at peace with her discomfort in a female body. Amy McAllister embodies the role with verve and charisma, making the audience sympathetic to consequences that arise from not telling Jules that she has a female, strap-on wearing body. The character’s good intentions are sweet, but not enough to save her. Kez grows up quickly over the course of the story, and the Internet gives her a wealth of information to help her explore her gender identity and legal options. Her social media accounts facilitate meeting girls, and it’s all too easy to set up alternative profiles that portray her as a boy. It also helps her find a local support group, so the sword that is growing up in the digital age is well and truly double-sided. This is a well-formed script with several layers. Whilst it is a powerful piece of storytelling as a solo performance, introducing additional actors to take on other roles would add depth to Kez’s experiences. McAllister uses the space well, though the opportunity to fully engage with the audience is missed. Both productions are generally excellent examples of storytelling. The differing perspectives on teenage love are delightfully nostalgic and provocative without becoming twee or trite. The Roundabout enhances their intimacy, but limits scope for design and staging. These two plays would be served just as well, if not better, in a larger space that enables them to extend their production values. Anthony Neilson didn’t come into Unreachable rehearsals with a script, but an idea – a director obsessed with finding the perfect light. From this starting point, the cast sculpted a modern satire of the film industry and the people that exist in that world. Over a six-week devising and rehearsal period, six actors worked with Neilson to create the play, a rarity in anything other than small-scale and student theatre. The end result is wickedly funny with on-point performances and, whilst the story isn’t anything remarkable, its execution makes for delicious relief from the chaos of modern Britain. Maxim (Matt Smith) is Palme d’Or winning writer and director of Child of Ashes, currently filming in an unnamed location. He pushes the self-absorbed, whimsical artist stereotype to the limit with full-on strops, totally inappropriate comments and decisions that blow his producer’s budget. He is camp, temperamental and a fantastic physical comedian. His lead actor Natasha (Tamara Lawrence) is an unfeeling, blunt force of a sociopath who clashes with lead actor Ivan “The Brute” (a sidesplitting Jonjo O’Neill in ridiculous hair extensions). On his production team are the pragmatic producer Amanda Drew, frustrated DOP Richard Pyros, and deaf financial backer Genevieve Barr. Their grounded personalities create plenty of friction (literally, in some cases) by clashing with the flamboyant artists as the shoot goes over budget and over time. Some of the arguments are petty, others deserving, but all just as hilarious. Nielson mocks artists’ egos, but it’s not nasty – anyone working in the arts will have met at least a couple of these personalities in real life. The comedy lies in the exaggerated characters and brilliant one-liners devised by Nielson and the cast. Even though the scenarios are fairly mundane and the story not particularly interesting in itself, it doesn’t matter one bit. There are some moments of poignancy and genuine intimacy, but Unreachable is really about the laughs. Even without familiarity with working in the arts, even the hardest, most cynical of hearts will find the outstanding performances hilarious. The scenes are often short and episodic, and half an hour could easily be trimmed, though the current two hours doesn’t feel overly long. Chloe Lamford’s set is the reflectors, flight cases and lights of a film set until the final sequence, when she and lighting designer Chahine Yavroyan can pull out all stops in an impressive display of visual mastery. The only issue with this moment is the fox. Instead of a puppet or forgoing the image all together, an animal that should be in the wild or a sanctuary is paraded about on a lead. It’s a totally unnecessary and cruel device. In these post-Brexit, unelected Torycore prime minister days where cracking a smile takes immense effort, Unreachable is welcome relief. Even though the play itself is nothing special, experiencing devised theatre in anything more than a tiny fringe venue that doesn’t go more than a couple of minutes without triggering a laugh is a welcome escape from real life. Unreachable runs through 6 August. Baz Luhrmann’s 1996 film Romeo + Juliet transformed a young generation into Shakespeare fans. Dan Poole and Giles Terera were training at Mountview at the time of the film’s release. They previously weren’t keen on Shakespeare’s plays what with their difficult language and having to read them at school. But, Romeo + Juliet changed all that. These avid Shakespeare buffs joined forces to make a documentary that explores why people don’t like Shakespeare, and to make the Bard more accessible to those ruling him out as boring or irrelevant. Over four years, Terera and Poole travelled around the world and interviewed prominent actors, audience members, people on the street and passionate theatre makers about their attitudes towards Shakespeare. Funny and relaxed, Muse of Fire feels more like a goofy road trip with your mates rather than a dry, academic film as the passion and love for Shakespeare’s work always shines through. A mix of untreated, shaky home video and professionally shot interviews provides a good balance between the lighthearted and the more serious moments. There’s still a sense that a lot of time passes, and the four years was not all sunshine and roses for the pair. At one point when desperately low on cash, Poole takes on some building work to pay the bills. Then the car breaks down on their way to interview Dame Judi Dench. On the other hand, they travel to Germany to watch pioneering Shakespeare work with convicts, meet the great and the good from UK theatre and beyond, and make it to LA to interview the man that converted them to Shakespeare to begin with. It’s a feel-good film with a few overly sentimental moments, but these are forgivable what with their boundless, puppy-like enthusiasm. The highlights of the 80-odd minutes are definitely the anecdotes and insight from actors like Dench, Tom Hiddleston, Ben Kingsley, Fiona Shaw, Christopher Eccleston, Ian McKellen and many others. Unfortunately, it feels like more of these prominent theatre makers are male than female (though I’d have to watch it again to count those who made it past the final edit). Audience interviews seem more balanced. Their opinions vary as to how to approach a script, deal with iambic pentameter and why they feel the plays are still relevant today but the range of views presented should reach even the most hardened skeptics. Muse of Fire is a true joy to watch, particularly if you love Shakespeare and the work of some of the best, most established performers in the UK and abroad. Over an hour of extras also back up Poole and Terera’s goal of Shakespeare appealing to everyone, regardless of language, nationality and background.